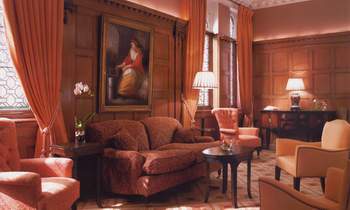 The Cadogan is an elegant townhouse hotel at the midpoint of two opulent worlds, in London's SW1, on Sloane Street, between Knightsbridge and Sloane Square. 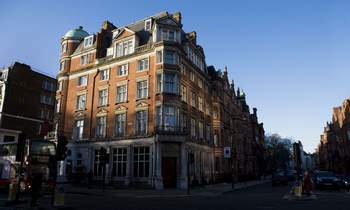 Located in the heart of London’s chic shopping area, guests exit onto Sloane Street, where Chaumet and Walter Steiger give way to Loro Piana and Prada, to Gucci and then Armani, as you make your way towards Knightsbridge. Once there, Harvey Nichols, Harrods and Peter Jones also jostle for your attention. 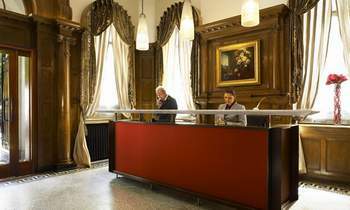 The Cadogan Hotel sits, too, within a short stroll or London-bus ride of Buckingham Palace Green Park and the Natural History Museum. The Piccadilly line at Knightsbridge or the Circle and District lines at Sloane Square are all just five minutes' walk away. 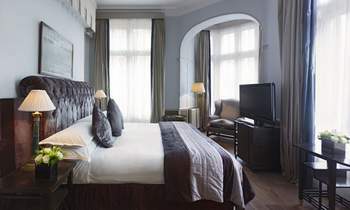 Chic, contemporary styling in a double room with queen-sized beds that will take your weight after a long day's sightseeing or business meetings. All on the first or second floor. Average room size is a spacious17 m² or 185 ft². LCD TV with wide range of satellite channels, Dual Line, direct dial telephone with voice mail, Electronic in-Room safe, Individually controlled air conditioning, The White Company bathroom amenities, RJ45 high speed broadband internet (category 5 wired) with US/Uk modem points, DVD player, Hairdryer, Steam iron and ironing board, Mini bar. 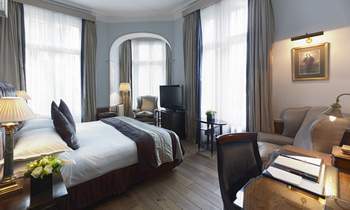 Chic, contemporary styling in a deluxe room with king or twin beds into which to sink after a day's shopping or a night at the theatre. Marble bathrooms feel cool against the soles of aching feet. 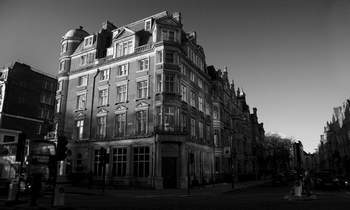 These are people-watching rooms with elevated views over Cadogan Gardens, Sloane Street or the side streets. LCD TV with wide range of satellite channels, Dual Line, direct dial telephone with voice mail, Electronic in-Room safe, Individually controlled air conditioning, Zen Zone bathroom amenities, RJ45 high speed broadband internet (category 5 wired) with US/Uk modem points, DVD player, Hairdryer, Steam iron and ironing board, Mini bar. Relax amid contemporary cool, with a queen-size bed, and a separate seating area to linger over tea or coffee with your complimentary international newspaper. 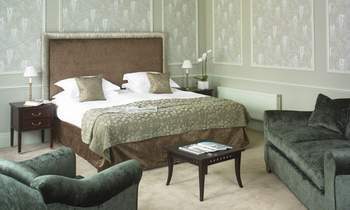 Spacious, WiFi connected guestroom accommodation is ideal for the discerning business traveller. 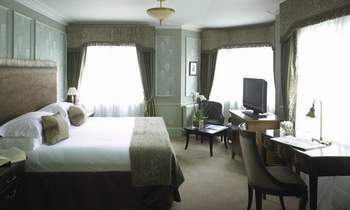 Room size average is 28 m² or 300 ft². 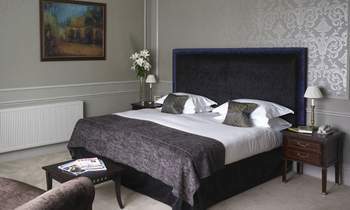 Relax and renew away from the rigours of the world, in king or twin beds. Linger just a little too long in piping-hot water in one of two bathrooms, then just add scent for a night on the town. 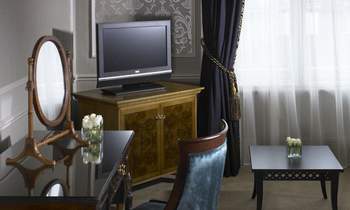 Spacious 1 bedroom suites with graciously appointed sitting area average size is 33 m² or 350 ft². 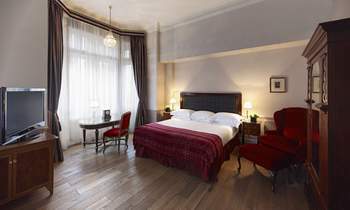 The Cadogan Suites are the epitome of discretion and elegant comfort and offer international travellers a welcoming home away from home. 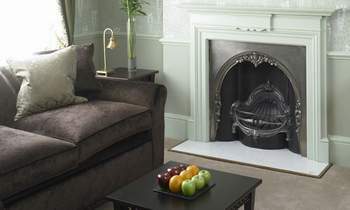 Classic décor with a contemporary twist in a separate living room and bedroom. 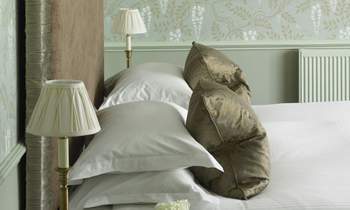 Slide between crisp linen and enveloping duvets and be seduced into a heavy sleep within minutes. In the morning, feel the cool of the bathroom marble on your feet. Privacy and comfortable elegance assured. 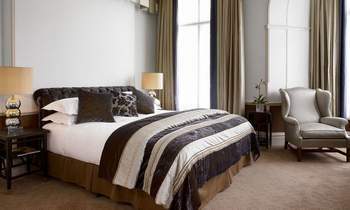 One Bedroom Suite Accommodation size average size is 39 m² or 420 ft². 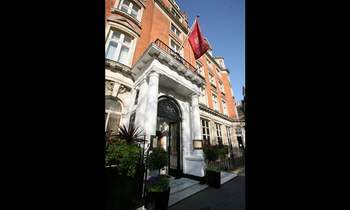 Let your appetite build as you explore Armani, Gucci or Harrods, or work out in our fitness studio, then let your taste buds loose at Langtry's, part of The Cadogan but a much-frequented luxurious SW1 Knightsbridge restaurant in itself. Slip in off Pont Street after a day's boutique-hopping or sightseeing and sit beneath striking original glass chandeliers and intricate ceiling designs. Start the day with a full British breakfast. Make your lunch an occasion. 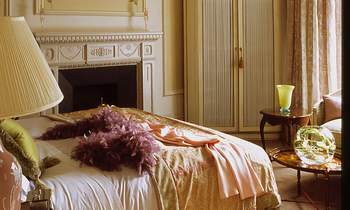 Or, in the evenings, light a candle with someone special and sip wine or brandy before the Carrera-marble Louis XIV fireplace. 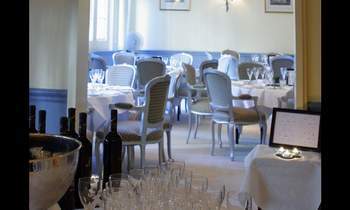 Feel the soft velvet of the warm, round medallion armchairs, and sample fine British dining London-style, in the elegant, yet informal, atmosphere. The setting, recalling the London banqueting and chic grandeur of Edwardian high society, is warm and intimate; the cuisine memorable. Head chef Oliver Lesnik adds imaginative ingredients to classic dishes that will have you salivating. The cheese is melted Hampshire Tunworth; the beef, Aberdeen Angus; the duck, Gressigham. It's a palate of flair and adventure that compares favourably with any of the top romantic London restaurants. Business meetings are about making vital decisions, stepping aside, pushing your limits and inspiring your team. Whatever the event, with natural light pouring through the lead-crossed, stained-glass windows onto the soft warmth of the clotted-cream and pale-blue tones of the chic décor, you're sure to feel uplifted. 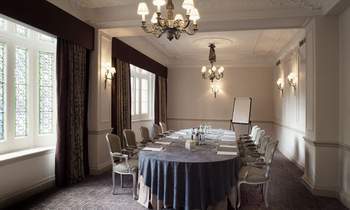 Beneath the stunning cornicing and ornate plasterwork, you can make the decisions that matter knowing that all your needs are taken care of, including wireless Internet access and blackout blinds for presentations. 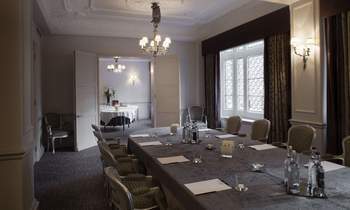 Both rooms can accommodate up to 70 for a reception: Salon Lillie can seat 32 for private dining and Salon Oscar, 12.